When I first heard the music of indie band Rue Royale back in 2007, they’d just released their first EP, The Search For Where To Go, which wasn’t an album you could dismiss in a hurry. Their profound lyrics and spare acoustic sound were a perfect stage for displaying the unusually striking compatibility of their voices and harmonies. In August, I interviewed Rue Royale’s husband-wife team, Brookln and Ruth Dekker, in anticipation of their September release, third album Remedies Ahead, recorded with the financial help of Kickstarter and a legion of followers. When the thin white parcel containing our handmade CD dropped through the postbox onto the doormat a few weeks ago, we were just about to leave for a week’s holiday. In spite of the packing and sorting and excited children and all manner of other craziness going on, I immediately put on Remedies Ahead. And again, and again: through icing two huge chocolate fudge cakes, ticking jobs off my to-do list, and making dinner for yet more people. Remedies Ahead is just the sort of album that you want to keep listening to over and over. The melodies are entrancing, with a hint of American West Coast trance-folk-pop finesse. Beguiling harmonies possess just the right blend of lyrical loveliness and musical perfection. Rue Royale have matured beautifully; their earlier unadorned sound is gone, but the gorgeous simplicity of gentle beats and harmonies remains, augmented by co-producer Paul Pilot’s electronic influences. This is a musically strong collection of contradictorily fragile songs, exploring themes of change and dark days in relationships and life, ultimately ending with an upbeat forward-facing decisiveness. One of my favourite tracks is “Pull Me Like a String”, with its gripping refrain “You pull me like a string, you pull me right in two, you put me out to the darkness and pull me back to you, You pull me like a string, you pull me right in two, You cause me to go blind yet I still look for you” describing a figurative dance of emotions that is echoed in the swing of the music and the relentless beat. Another is “Brought Up Somewhere Else”, with its sense of geographical displacement: “Ancient are these rolling hills, Aged brought up somewhere else”. I could personally identify with this one, having lived in the UK now for thirteen years as an expat American, similar to Brookln. I also liked the rhythmic catchiness of honest anthem “Try As They Might”, with it’s memorably repeated line “Try as they might, they cannot get me down”. “Dark Cloud Canopies”, “Almost Ghostly”, and “Shouldn’t Have Closed My Eyes” are melancholic explorations of feelings and relationships. “Settle In Settle Down” considers the uncertainty within decisions we have to make as we walk towards the future: “I know it well the feeling, that we’re both circling around, I know the roads that we’re found on are often paved with doubt”. “Every Little Step” is Remedies Ahead‘s perfect ending: “Working on getting my mind around this road ahead, Can’t go back can’t go backwards”. This determination to push on in spite of the darkness is what characterises this ultimately positive album. I recently caught up with Anglo-American duo Rue Royale, as they release their single “Set Out to Discover” in advance of their upcoming (September) album Remedies Ahead. The beauty of Brookln and Ruth Dekker’s talented husband-wife musical team lies in their strong lyrics and brilliant vocal harmonies. Let’s start right back at the beginning. When did you guys get together as a band and how did it come about? BROOKLN: We were already married for 3 years by the time we started making music together. We were living in Chicago. I had been playing in another band (Trevorside) that had just broken up. In fact, I think it might have been the very same night that I came home from a band meeting where we decided to dismantle the band that we wrote our first song together, ‘Even in the Darkness’ from a song-nugget I was already kicking around. It was a very natural thing. Our family had joked about us starting a band together but we had always thought it was a cheesy idea. When we wrote ‘Even in the Darkness’ we put it up on Myspace, I think the same night. We immediately were getting positive responses from friends and family who would easily tell us if they didn’t like it. It felt real and more importantly it felt good so we followed the thread. RUTH: It had to happen that way, like an accidental happening. We never planned it and I don’t think anything would have happened if we had tried to “become” a band, it was a natural reaction musically and directionally to what was happening in our lives at the time. We were “whispery” folk because of the crazy neighbour upstairs who would yell at us for being loud. Do you write most of your music together or separately? BROOKLN: It’s an evolving process. Sometimes one of us writes more than the other of a particular song but we’re a team and always end up finishing the song together. We can both write songs without the other’s help but not Rue Royale songs. Those songs take both of us. RUTH: It normally starts with Brookln pacing around playing guitar parts and murmuring vocal parts. I join in and we wrestle with it and each other finding meaning for the melodies. It is normally a very intense process. RUTH: At this point I play keys, glockenspiel, percussion (shakers and snare drum) and a sampler. I do play the guitar albeit rustily at this point! Who are some of your strongest musical influences? BROOKLN: Our musical influences are always changing and we make a conscious effort to not mention other artists when we’re writing or producing in an effort to stay out of the way of what needs to happen or escape creatively. Saying that, I grew up on Gospel, rock and folk. I tend to listen to anything involving Mark Koselek, Thom Yorke or Fleetwood Mac members the most. RUTH: I don’t know who actually influences my musical contributions to the band. I love the artists Brookln just mentioned but I also grew up listening to Brit-Pop and northern soul which I do hear in our music when I listen back. Electronic artists like Air really played a part in our journey at the beginning too. I really enjoy listening to jazz alot and can get stuck in that for months on end. To describe your sound to people who haven’t heard you before, I’d call it “chilled, slightly melancholic indie singer-songwriter folk-pop sung in late night lamplight with unlimited coffee”. How do YOU describe your music, and how would you say it’s evolved since you released your self-titled debut LP in 2008? BROOKLN: I don’t typically describe it. I normally cop-out of this question but for those who haven’t heard us I’d say we play harmony-heavy hypnotic, vocal, guitar and pulse driven songs of yearning. The changes to our music along the way the same as are those that life brings. Simple evolution. We still play our hearts out..
RUTH: I have recently quit coffee because it makes me crazy but I like your description! I think we have taken more risks as we have grown in confidence. I am playing a sampler right now which is a big leap from the early days but I can still hear the electronic influence even though it wasn’t played out during the first album. Remedies Ahead is your third album, recorded with the help of Kickstarter. Can you tell me how that came about, and how it worked out for you? BROOKLN: We had heard of Kickstarter before. We’d followed a couple of projects and saw how it worked. Basically, we couldn’t afford to make the album we wanted to make. We wanted to get into a studio with our buddy and co-producer Paul Pilot for a couple of weeks with nothing to do but make a record. Both of our previous albums were recorded in home studios where distraction is easy to come by. We had run a small pre-order to help raise the money to press our Guide to an Escape album in 2010 and it seemed to go really well so we thought we’d give kickstarter a chance. The Kickstarter campaign was a lot of work. I mean a lot of work. It’s not easy to send out enough reminders to family, friends and fans that they all see it and have enough chance to respond to it without annoying everyone who isn’t interested in responding or seeing these messages. But we got there and went over the minimum we were asking for. Our family, friends and fans are amazing. You have a large following in Europe and the UK and your fans here have plenty of chances to see you play live. Do you have any future plans to tour in the US? BROOKLN: It’s really tricky for us to get over to the States to tour because Ruth is English and we need a work permit for her to be able to perform (legally). We’re working on this but at the moment we don’t have any help Stateside. So it’s a bit tricky. You tour extensively in Europe, but maintain a home in the UK. Where would you like to live, if you could choose anywhere, and why? BROOKLN: Good question. We don’t know. It’s something we talk about a lot though! We have a dream of a small country house with a garden, a small orchard and studio but in what area/country we know not. RUTH: We have spent so much time away from “home” and have friends all over the place it makes it hard to know where to be. We miss the seasons and the warmth of Chicago summers so wherever it will be it needs to be a little bit warmer! You play a lot of European coffeehouses. Do you actually drink coffee? RUTH: argh! I am trying to quit…. I have tasted some incredible coffee and Brookln makes a mean cup in many forms, he is a true coffee fiend. Andy Baxter and Kyle Jahnke are Penny & Sparrow, hailing “from the heart of Texas” –Austin, to be exact. This indie band self-released their album, Tenboom, last year using a Kickstarter project. I’ve enjoyed listening to Tenboom and wanted to find out a bit more about them. How long have you guys been together as a band? We’ve been together as a band for about two and a half years now. We started off as roommates in college, and then began recording a few songs here and there as a hobby, which has now turned into much more than that! We released [single] Creature on iTunes and had so much fun with the process that we haven’t stopped. Interestingly, we now live together again – we moved into a giant house with our wives so we could write and play music and be roommates again. I noticed that you do a lot of great covers. Who can you cite as some of your strongest musical influences and how do you incorporate the sounds you love into your original music? Thanks! We both have our own musical favorites that mesh and overlap really well when we write. We both love bands like The Swell Season, Sufjan Stevens, Bon Iver, and Mumford. Do you write your music together, or separately, or a bit of both? Our songwriting process works well for a duo, we think. We both start off writing separately in our free time, Kyle mainly focuses on the music and melody, and Andy loves lyrics. When we sit down together we’ll bring all our ideas we are confident with to the table at the same time and mesh the two together. At this point there’s more overlap with who does what. Apart from a few songs, we always write songs together. What gave you the idea to go for the Kickstarter project and how did it work for you? Where did the name of your album come from? We were hesitant to do a funding campaign for our music, but were encouraged by some friends who believe in us. We were blown away by the response, and are so thankful for those who supported the project. [Tenboom] came from a conversation we had about a woman named Corrie ten Boom. She has an incredibly inspiring story, and we thought “ten Boom” was a beautiful name. What’s next for Penny & Sparrow? Like I said before, we’re currently living under the same roof, writing songs and touring. We are a month away from recording another album. Between this and touring throughout the States, we’ll be pretty busy! Tenboom beautifully showcases Penny & Sparrow’s subtle, vocally-driven acoustic sound. There’s a guitar. A kick drum. Some keyboards. A bit of quiet percussion. The thread that draws this album together, made apparent straight from the beginning in “Just and Just As”, all the way through to the ending lullabies “Patience, First” and “Patience, Please”, is the flawlessly sweet harmony of Kyle and Andy’s vocals, with the afore-mentioned classic rock/country background evident in their style. Alela Diane’s first album, The Pirate’s Gospel, captivated me from the beginning, with “Tired Feet”, right to the final notes of “Oh! Mama!” Her gently strummed guitar and soothing voice were a welcome accompaniment to both busy mornings at home and long car journeys in the rain through the Welsh countryside. Her second offering, To Be Still, uniquely captured an essence of “home” for me. Something about the imagery, the descriptions, the stories reminded me of my roots in a way that no music has for a long, long time. Maybe it was her high-cheekboned pioneer woman face peering from the album cover through blurred, shining lace. I think that by the time her third release [Alela Diane & Wild Divine] arrived on the scene, I was so stuck on the first two that it made little impression on me. I’m not brilliant at moving on quickly from instantly-loved favourites. Sometimes I listen to particular albums for years before truly “discovering” them. But it’s this fourth recording from the Portland, Oregon-based singer that I’ve been waiting for. About Farewell was definitely worth the wait, more than I ever could have imagined. It played all morning as I was deep in a long candle-making session. As I worked, amidst the mild distraction of creating candles, I fell in love with About Farewell. Diane’s voice has strengthened noticeably. Her range has always been remarkable but on this album it’s obvious that she’s more than capable of everything she attempts. Her wisely scant instrumentation allows her clear, beautiful voice to shine out and draw attention to her repetitive, honest lyrics. It’s rare to find an album like this, with every single song possessing a powerful emotional punch that pulls you in right away. She has returned to the delicate acoustic sound she does so well, with a newer, deeper maturity. She pens all her own lyrics, which have evolved from the sweet story-telling of The Pirate’s Gospel into personal poetry that makes you feel as if she’s telling you all about herself. We begin to understand the darker intricacy of the relationship she’s mourning after hearing “Nothing I Can Do”. “Lost Land” is the most subtle song on the album, as she questions herself and finally declares: “I’m a lost land in the blue.” “I Thought I Knew” seems to be a further exposition of the deep fissures within this dying relationship. “I called you up and drew you in, I thought I knew you, but I was wrong… I’d only just arrived when I foresaw the end.” “Before the Leaving” tells of her touring lifestyle, with constant references to the storm of the impending break-up, returning home with the final poignancy of the line: “Now there is wood that you stacked, and it’s on our front porch; it’s staring me down, and it tells me you left.” “Hazel Street” and “Black Sheep” are slow story ballads, while “Rose & Thorn” ties up the strings of this heartbreak with regretful lyrics like “O, the mess I’ve made, a crimson rose, a hundred thorns”. Diane split with her husband last year and it seems as if writing this album was some kind of cathartic release for her, helping her walk through saying goodbye in the midst of what appears to have been an incredibly painful break-up. After listening to About Farewell, it sounds as if she’s also working through other damaging relationships in her life. She does it so well. About Farewell is wonderfully melancholic, but not depressive. It is beautifully sad, but not hopeless. There is a timeless, elegant feel to the entire album, hinting that Alela Diane will someday deserve a place in the golden circle of iconic singer-songwriters. In my opinion, she already does. I’ve just finished listening to Corbeau for the second time and have repeatedly found myself unconsciously toe-tapping along to the music. These guys can play! Calling themselves a “bilingual traditional music trio”, they hail from Prince Edward Island. I’ll be dreadfully honest here and say I was initially interested in them merely because they were from Anne of Green Gables land. I really can’t remember the last time I heard of a three-piece band, stomping out cèilidh melodies and occasionally singing along, from Prince Edward Island. Actually, I’m not sure if I’ve ever heard of a band from Prince Edward Island. I haven’t a single word to say in my defence, either, except that my knowledge of P.E.I. is rather narrowly confined to the Edwardian era of L.M. Montgomery’s novels! Thinking about this Canadian island’s historical connection to settlers from Scotland and Ireland, it makes sense that their influences clearly sound Celtic. They self-released Corbeau last month, an epitome of toe-tapping wonder. The entire album makes you want to get up and dance, full of good cheer. My four-year-old daughter subconsciously gave in to the music and went to fetch her ballet shoes as Corbeau played in the background. 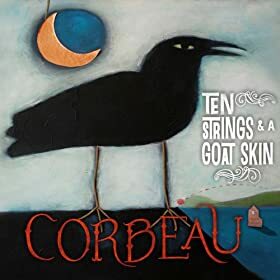 Corbeau has a perfect balance of music and vocals: enough lyrical interest to keep the album from morphing into a full-on cèilidh, and wordless silence during instrumental tunes when the music speaks alone. Band members Jesse Pèriard [guitar and banjo], Caleb Gallant [cajon, bodhrán, djembe], and Rowen Gallant [violin, mandolin, and bazouki] blend traditional music with their own compositions. “Huginn and Muninn” kicks off the album. It’s an uplifting, fiddle-led, tradition-fed tune. Sufficiently joyous, we move on to “The Grey Funnel Line”, driven by an energetically percussive guitar. “The Night They Moved the House” is a classic story-ballad, ending with a hand-clapping, catchy chorus. “Kick the Crow” brings a minor note into the mix, but is none the less spirited, with impressive fiddle-work from the band’s violinist, Rowen Gallant. Introducing a more sedate –or inebriated– note into the mix is a rendition of an old Cajun drinking ballad, “Parlez-Nous À Boire”, loosely translated “Let’s talk about drinking”. The slower thread continues with “The Uniform”, a regretful goodbye from a soldier dying far from home. Next is an instant pick-me-up, an integrated trio of fiddling tunes: “Napoleon’s: The Drunken Police Car/The Box Reels 2/Music for a Found Harmonium”. I love the wistfulness of “Farewell to Uik”, which follows, along with more dancing music: “The Liffey Reels” and “The Byzantine Reels: Fir Bolg/Tastes Like Grapes”. At this point, the album appears to be finishing on a gentle note with the sweet French “Vive la Rose”. Instead, a splendidly robust version of “Bully in the Alley” blasts out right after, bringing everything to a close with just the right amount of fun. FUN is the operative word here, I think! Ten Strings and a Goat Skin are clearly having a great time with their music as they blaze their island trail. Corbeau is sufficiently promising for such a young band and I’m looking forward to seeing where their musical path takes them. It’s sure to go beyond the borders of their native P.E.I. 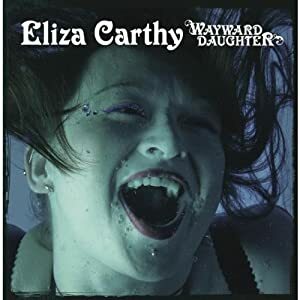 Whenever I’m in the mood for listening to proper English folk, I often turn to Eliza Carthy. Her career has spanned twenty-one years, much of the early days spent touring with her parents Norma Waterson and Martin Carthy. Wayward Daughter, released in June by Topic Records, is an extensive compilation of her work and a brilliant exposition of her capabilities as both performer, musician, and interpreter of traditional English music. In spite of her folk royalty status, Carthy is not a traditionalist, so the album is a fascinating blend of medieval melodies combined with more modern instrumentalism. 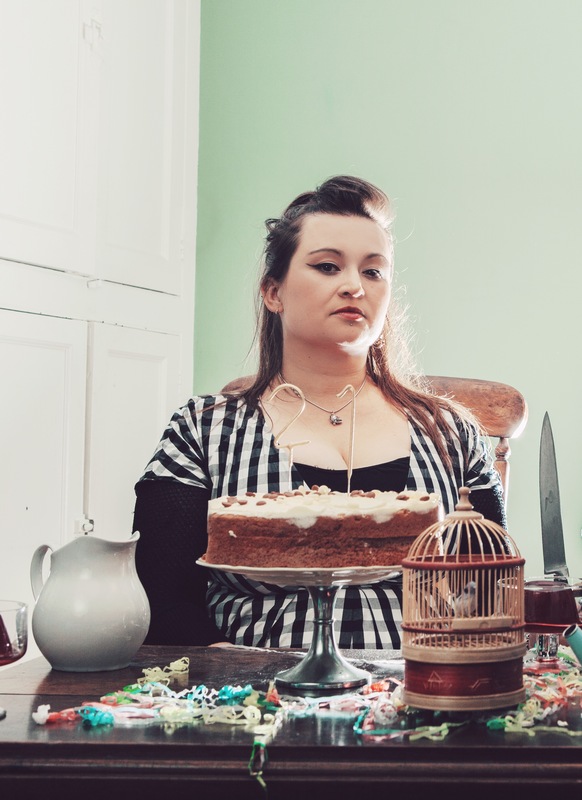 For me, the most distinctive feature of Eliza Carthy’s music is that she plays the fiddle energetically, all the while belting out tales of woe in her strong, earthy voice. Wayward Daughter is clearly her unadulterated view of herself and her music, and a very accurate one it is at that. Punk undertones to these traditional tunes remind me of folk artists like The Bushbury’s or folk rockers The Levellers, while the accordion and fiddle sing together in flawless harmony. The first track on Wayward Daughter, “Worcester City”, is a dark ballad of poison and murder told in stark verse. The melancholic theme continues, uplifted here and there by the oddly fitting Spanish verse in “Grey Gallito” [accompanied by Salsa Celtica], ceilidh-style jigs in “Cobbler’s Hornpipe”, and everywhere Carthy’s enthusiastic, unwearying fiddle shimmering across the lyrics urging the stories forward. There are thirty-one epic tracks here, each one a treat. This album is a perfect onslaught of beautiful music. I listened to it for the first time one evening while preparing food and barely noticed the time passing. As soon as I was immersed in the story of one song, it ended and the next one began even as I was still thinking about the last. I found myself sensing a strong connection to the history of the land around me, wondering how long the foundations of these stories have been told in verse form and where they actually originated. It’s like walking through the home where Shakespeare was born and feeling hundreds of years disappear, into the reality of a candlelit room with a trundle bed and an uneven floor and a newborn whose plays would live through the ages. Wayward Daughter is this year’s Anglicana: memorably English yet also very 2013.